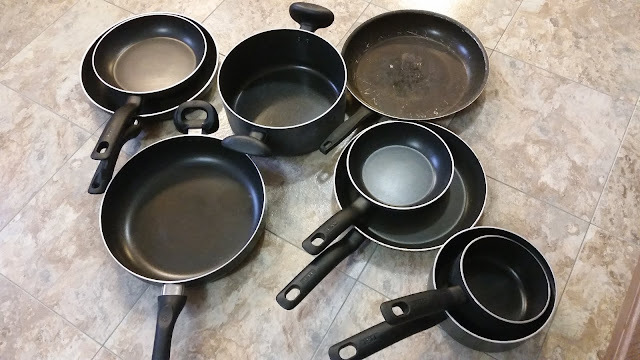 I took a few minutes to sort the pots and pans this weekend. I pulled all of the nonstick ones out of the cupboard to determine my next move. The really scary awful one at the top went directly into the trash. (Oh my god, did my husband cook food I ate in that? Best not to think about it.) The others got stacked neatly in the basement. Since I didn't purchase them I don't feel right disposing of them. But I also don't feel like offering them to my husband to take. When he first left (and many times since) I suggested he take his stuff. I figured anything he came into our marriage with he had every right to take with him when he left. He insisted all he wanted were his clothes and laptop (and tools and wine-making paraphernalia). I can only assume he went out and spent thousands of dollars equipping his new house with everything needed to provide for himself and his new family. As such, I don't want him getting grumpy about how he could have saved money on pots and pans. I also don't want to listen to his snarky comments on my alarmist behavior since he doesn't share my concerns for our personal health or the health of our environment. I am left with a plenitude of Revereware sauce pans and one large Calphalon frying pan. While these may not be the best options available, they are certainly better than what I was using (see above). Bonus: two of the shelves are much more sparsely occupied which appeals to my minimalist side. Good for you for cleaning out. Glad if you can get use out of the revereware, which is actually good stuff.